How can a nation long survive if it has no respect for truth and personal dignity? It can't. The dark, slimy tendency to glorify those who distort truth for political gain can have only one transcendent effect: to diminish each of us, as individuals and as a community. To the extent that we excuse the political skullduggery of the Clintons in the belief that political deception is essential to victory, we fracture our national foundations, corrupt our political dynamics, and diminish the promise of our future. The Clintons have resorted to a low brand of politics, one made famous by the likes of Lee Atwater, Karl Rove, and Harry Dent. This political behavior glorifies neither them nor the American people. It needs to be repudiated if we are to protect what is sacred in our traditions. Should the Clintons be allowed to win the Democratic primary using the politics of fear and deception, historians will write less about the political skills of the Clintons than they will about the diminished character of the American people. They will say that we didn't care what kind of country we we were becoming. They will say "we the people" chose to imitate the rowdy masses that cheered the lions and Roman gladiators at the Circus Maximus. It was not long ago the American people had to confront a similar choice. In 2004, they had to decide whether to repudiate dishonesty or affirm integrity. They succumbed to fear and chose deception and dishonor. But by so doing, they shamed themselves before the entire world. Fear and freedom cannot stand side by side. They are contradictory opposites. The ascendency of one diminishes the other. The politics of fear always lessens freedom. We face a similar choice today. It's not too late to regain our senses. What's all this boasting about Hillary's experience? What makes her better prepared for the presidency than Barack Obama? 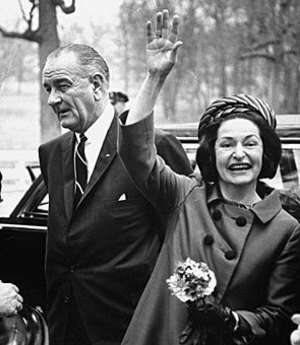 Has Hillary an experience different than Lady Bird Johnson? Or Pat Nixon? Or Betty Ford? Or Rosalynn Carter? Or Nancy Reagan? If so, what is it that sets her apart from these other First Ladies? Yes, Hillary was elected to the US Senate. No other First Lady has held elective office. 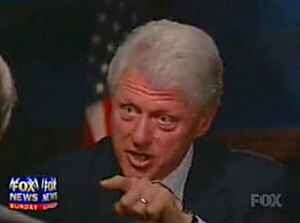 But in her campaign for the presidency she vaunts openly about 35 years of experience! No one would have seriously considered Lady Bird, or Pat, or Betty, or Rosalynn, or Nancy fully prepared to assume the duties of the presidency. Not then. Not now. Yet each had an experience at least the equal of Hillary. Indeed, apart from her seven years in the Senate, the only thing that appears to differentiate Hillary from these other First Ladies is personal ambition — unless, of course, she can make a case for having a richness of experience the others lacked. To date, no such case has been made. Nor has it been attempted. Without explanation, Hillary has proclaimed experience to be the mantra of her campaign. "I'm ready to go on day one!" That's her claim. Yet the question continues to linger: What is it about Hillary’s 28 years of experience prior to becoming a US Senator that is so distinctive? What did she do that distinguishes her from the other First Ladies? Or from Barack Obama? Obama, after all, has more elective experience than Hillary! It’s no secret that Bill and Hillary are both ambitious to a fault. Some suspect ambition alone explains Hillary's campaign -- that she'd say anything and do anything to get elected. To them, the bit about experience is but a contrived narrative choreographed to set her apart from Obama. Yet, no one knows for sure. The question of Hillary's experience remains an enigma. Does her storyline reflect something real? Or is it merely illusory? Does it point to a personal weakness cautiously concealed? Or not. Whatever it is, the American people need some clarification. Otherwise they will be unable to judge soundly the intrinsic merit of her candidacy. The story of America is no simple narrative. Every period of its history is dynamic and dramatic. Whether it be the Revolutionary period, the Westward movement, the Civil War, the tides of immigration, the women’s suffrage movement, the labor movement, the civil rights movement, the women’s liberation movement, the gay rights movement, or the environmental movement – all phases of American history represent heroic struggles to give shape and substance to the universal notions of personal dignity, individual freedom, and human solidarity. Thus the struggle for the future of freedom never ends. It requires that everyday, someone, somewhere applies their creative energies to challenge the old order and replace it with the new. It requires this to happen in business and science, politics and law, cinema and television, music and sports, education and news, and on and on. America’s story, like its promise, is that of a nation on the march holding high the banner of dignity, freedom, and solidarity. It is a dynamic and living spectacle giving inspiration and hope to all mankind. To remain vital in the world, America must struggle to remain vital here at home, particularly in this Information Age where news in the City of New Orleans, or about a high school known as Columbine, is instantly news everywhere around the globe. 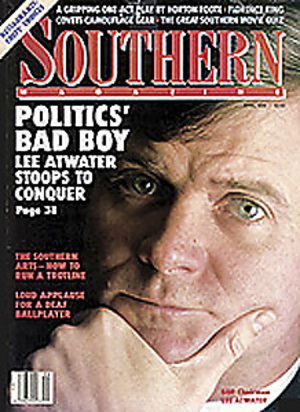 Atwater died in 1991 at the age of forty from a brain tumor. Shortly before his death, he converted to Catholicism through the assistance of a Jesuit priest, Fr. John Hardon, S.J. As part of his process of repentance, Atwater released a number of public apologies and wrote letters to individuals whom he hurt throughout his career. Corrupt ideas underlie most problems facing America today. We are informed and guided by ideas that not only debase the human spirit but corrupt our relations with other persons, nature, and God. Being so enslaved, spiritual alienation and its effects are destined to strike at our efforts to forge an integral human existence. The mythology of the self-contained, autonomous individual is one such idea. This myth shapes much of American culture, including its socioeconomic and even religious life. But if the truth be told, the notion of the autonomous individual is only a mask that enshrouds an inner emptiness and aloneness. It is the same mask worn by Citizen Kane whose lust for power denied him the fulfillment he sought. It is the mask worn by Tom and Daisy in The Great Gatsby. 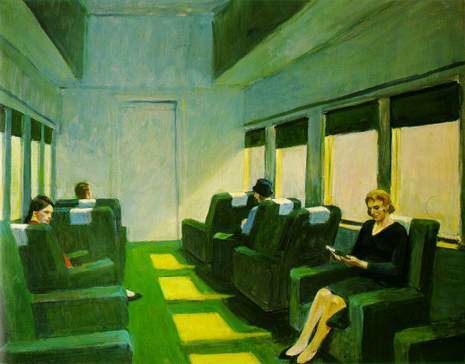 It is a truth that permeates the paintings of Edward Hopper and the photographs of Robert Frank. It is the cry of anguish that radiates from the spirituals of the cotton picker, the painful stories of rural and urban Blues artist, the social voice of 1960s R&B, and the modern prophet crying out from the wilderness of the street, the poetic artists of Rap and Hip Hop. Neither power, nor wealth, nor reputation can free a man from his existential aloneness. Lurking behind every Horatio Alger story is a human tragedy waiting to unfold. Every person reels under the weight that disaffection lays on their soul. No one in America, or so it seems, can escape the ubiquitous impact of cynicism and distrust, violence and fear, intemperance and injustice, and the isolation and aloneness that ravages so much of our national life. Statistics on homelessness, substance abuse, youth violence, corruption within the family, and the litany of social and economic inequities have long told this tale but only through numbers. Yet, lurking in the shadows lies the specter of the autonomous individual. Anthropological atomism is embedded in American culture, and it acts as the wellspring of a spiritual alienation that rages unabated like a firestorm across the land. Its alluring dynamic fragments and distorts the nation’s institutions. It corrupts the lives of present and future generations. In every respect, its impact constitutes a serious intellectual, moral, and cultural challenge to an integral America. Faced with this reality, Americans carry a greater burden in their hearts and minds than they do on their backs. Alienation or love, pride or humility, indifference or compassion, judgment or mercy – these disjunctive qualities give form to the decisions we make in all aspects of our lives. Whether rich or poor, socially placed or displaced, educated or uneducated, religious, agnostic, or atheist -- whether Caucasian, African-American, Hispanic, Asian, or Native American -- each person wrestles with the transcendent nature of decision. At every juncture, we act to incarnate perfecting qualities into our being and relations -- or act not to do so. Recently, I watched a documentary on the life and paintings of Francisco de Goya (1746-1828), the Spanish painter. It was spell-binding. 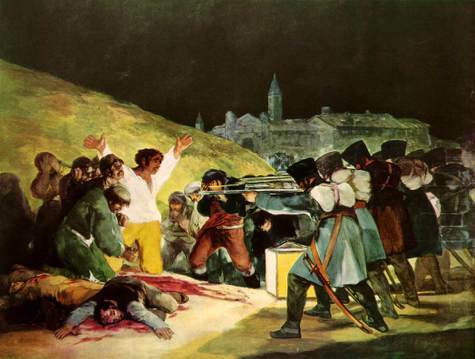 Goya's work reveals the unvarnished truth lurking in the darkness of the human spirit. To be sure, he painted as well the heights to which man ultimately aspires. But these heights were invariably placed within the context of human depravity. Brutal concreteness is firmly etched in his work as is man's quest for transcendence. This living tension between the universal and the particular sprang from Goya's dedication to Truth. This photographic image (right) is one of a series of images I've taken of homeless individuals in Washington, D.C. 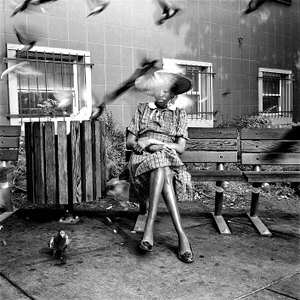 The series is entitled Homelessness in America: The Unmet Need to Belong. Each image in this series reveals through the lives and faces of individuals an "interior presence" whose poignant energy and pathos communicate to the viewer the conflicting dynamics of love and alienation. Initially the image comes alive as a living metaphor symbolizing the alienation of the person from the spiritual bonds of community. But, even more profoundly, each image penetrates beyond the "metaphor of alienation" and discovers in the dynamic core of the person a certain restless and irresistible "crying out for love and community." 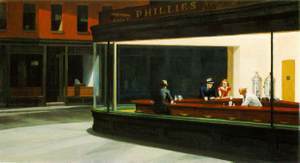 The metaphorical quality of this restlessness for love gives these images a unique capacity to establish a profound and lasting dialogue with the viewer. To be sure, each image presents a brutal and unsettling presence of spiritual alienation. Many who see them will hesitate, grow uncomfortable, and perhaps recoil. Some may even turn away out of anxiety and fear. The conventional counter-wisdom to the Bush/Rumsfeld transformation strategy is that more military forces were needed from the outset to achieve success in postwar Iraq. This view was set forth by General Shinseki and rebuffed by Rumsfeld and Wolfowitz. The military held a similar view during the Vietnam conflict. To my knowledge, this belief has never been thoroughly examined in public debate, neither then nor now. This neglect leaves a huge gap in America's strategic thinking because the logic of "more or less conventional military forces" masks the underlying truth of America's political failure in both conflicts. Unless we debate this assumption more thoroughly, America will repeat the same mistakes again and again against future terrorist threats and insurgencies. 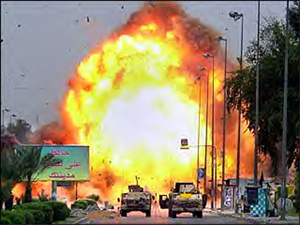 Violent Explosion in the Center of Baghdad. There exists a third view: a military solution in Vietnam or Iraq was never possible. To think otherwise is the product of reckless fancy. A political strategy, i.e., civic action, is the only viable option. The logic of this truth should have been obvious from the outset in both wars. Bush faces Johnson's earlier dilemma. The inadequate force commitments made respectively in 1965 and 2003 ordained our inevitable failures. In both cases, more able leaders were necessary, but maybe neither conflict was winnable within the parameters that this nation was willing to, or should, endure. The first law of strategy is to know the maximum that you are willing to pay to achieve an objective. But, is it really "about inadequate force commitments?" 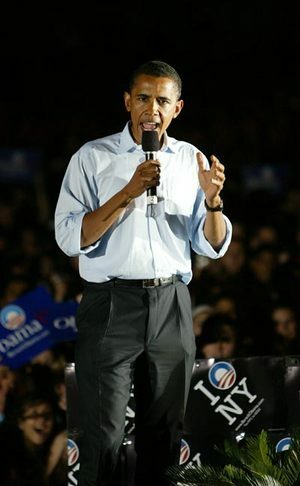 Is there really a need for more "swaggering leaders?" Is it really about our reluctance to "pay a high price" for victory? Is our failure in Vietnam and Iraq really a failure of will and our unwillingness to commit the adequate number of troops on the ground to succeed? Is the Powell Doctrine sound?